MyFax.com is a user-friendly online faxing service for personal and small business faxing solutions. Customers actually have the option of sending their faxes using the company user interface or their own email. Full integration with Microsoft Office and Outlook means their service runs very easily. Myfax includes a number of account management services and features along with some of the strongest security options available which is why we rate them as a top online fax provider. As with any solid online faxing service, myfax.com offers tons of tools and features. 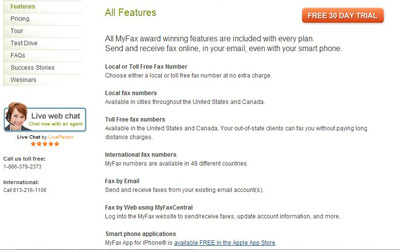 To begin, users may send and receive faxes whenever they need to from wherever they are. The service is available through the website interface which can be accessed via your phone, tablet or desktop browser; or you can access their service via your email provider on any device you choose. They even offer a free mobile app for iPhone users, an added convenience at no added cost! Get started with myfax by choosing a fax number. You can select a local or toll-free virtual number within the US and Canada. No need for installing an additional physical line. Now out-of-state clients or customers can reach you without paying long distance charges. International numbers are also available in 48 different countries. Easily manage all your contacts including the ability to upload or download lists. Share your fax account with others by including up to 5 different email addresses. You will also have access to all sent and received faxes (they are stored for the lifetime of your account). The service also includes an auto resend feature in the case of delivery failure. Confirmations are also instantly sent to you via email. Send to up to 50 recipients at once and 178 document types. 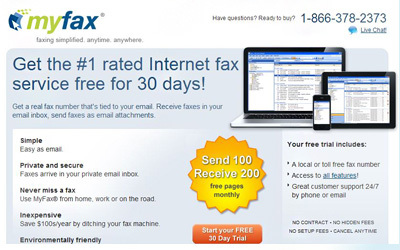 For those who need the strongest fax security possible, MyFax.com is a top choice. The service uses 128-bit SSL security along with additional data encryption methods to keep all data transfers extremely safe. This also works with any type of fax machine, so there is never a concern over hardware compatibility. You are also able to set up automatic junk fax identification as well as reporting any of these that are received. Of course, everything sits behind your strong account password and log-in details. There are three different plans to choose from here at MyFax.com. All of these options include access to every feature. The only real difference is with the number of included fax pages that can be sent and received. For example, the best value plan includes sending up to 100 and receiving up to 200 pages per month. The most popular plan offers 200 sent and 200 received pages per month. Finally, the Fax More plan offers the ability to send and receive up to 400 free pages each month. Additional pages over these limitations do incur extra fees, based on the country that it is sent to or received from. 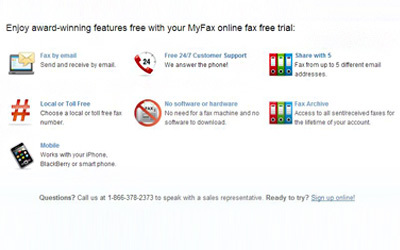 The three options for the MyFax.com service have very clear pricing guidelines. The Best Value plan includes 100 sent and 200 received pages each month for $10. The Most Popular plan offers 200 free pages (sent and received) for $20 per month and the Fax More plan offers 400 pages (both ways) for $40 monthly. Per page charges for exceeding these limits is $0.10 each. Being able to integrate the online system with your own email service makes this very easy to use. It also integrates into ACT software, so those engaged in customer support activities will benefit greatly from this. Of course, you can always log into your online account and hit the send a fax button, or look through your history. Compared to most online fax services, MyFax.com customer support options are a breath of fresh air. There are online FAQs, overviews, success stories, and even recorded webinars. You may send an email to support staff, which is usually answered fairly quickly. Or, call their toll free support phone line. They also have live online chat, although this looks to be limited to normal business hours. The test drive section is similar to an online demo and can be very helpful. MyFax.com could be a perfect option for an individual user, self-employed professional, or even a small business. Of course, you would not want to exceed the number of pages allowed by your chosen plan. But being able to tie the service together with your email, MS Office, Outlook, and number of other commonly used programs and tools makes this very valuable and easy to use.